U.S. Senators Chuck Grassley (R-Iowa), Amy Klobuchar (D-Minn.) and Tina Smith (D-Minn.) reintroduced bipartisan legislation to help family farms reorganize after falling on hard times, according to a press release from Sen. Smith’s office. The legislation is also cosponsored by Senators Ron Johnson (R-Wis.), Patrick Leahy (D-Vt.), Thom Tillis (R-N.C.), Doug Jones (D-Ala.) and Joni Ernst (R-Iowa). As bankruptcy rates among American farmers near record highs, the Family Farmer Relief Act of 2019 would raise the chapter 12 operating debt cap to $10 million, allowing more family farmers to seek relief under the program. Several years of low commodity prices, stringent farm lending regulations and recent retaliatory tariffs have taken a toll on America’s agriculture producers. Farm bankruptcy rates in many farming regions across the country are at their highest point in a decade. In some places in 2018, farm bankruptcies doubled from the previous year. Debts held by farmers are nearing historic levels set in the 1980s, further financially extending farm operations. Sens. Klobuchar, Smith and Grassley first introduced this legislation in December. Click here for the full text of the bill. As Congress is considering reforms to chapter 12 bankruptcy law to allow more financially distressed family farmers to remain in operation, a recent CRS report found that farm income has declined over multiple years since 2013 and that the number of reported farm bankruptcies has begun to increase. The Federal Reserve Bank of Minneapolis observed that chapter 12 farm bankruptcies increased in 2018 across the Midwest and appear to be higher among dairy farms. The American Farm Bureau Federation has compiled farm bankruptcy data from the U.S. Courts at the national level. According to this data, in 2018, 498 U.S. farms filed for chapter 12 bankruptcy, nearly constant with the 501 farm bankruptcies in 2017 (a rate of about 2.5 per 10,000 farms). The continuing steady number of farm bankruptcies at the national level masks an increase in filings across 19 states, particularly in the upper Midwest, where a 19 percent rise in annual chapter 12 filings has occurred since 2017. 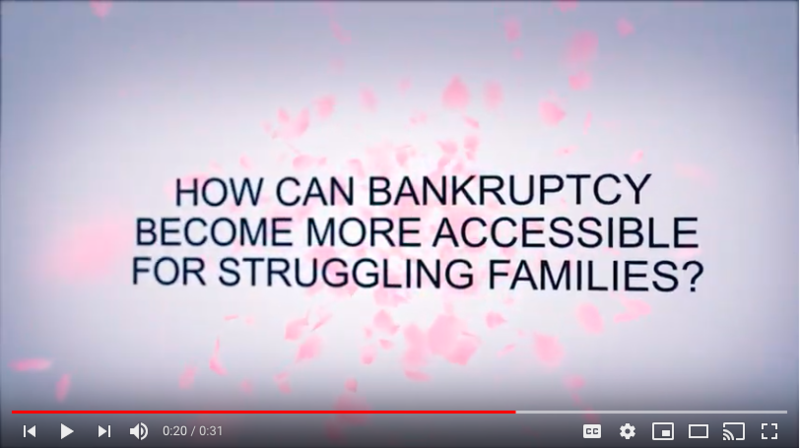 Wisconsin had 47 chapter 12 bankruptcies in 2018, one-third more than the next highest state (Nebraska) and 18 percent above the number in Wisconsin in 2016. ABI Deputy Executive Director Amy Quackenboss talks with a distinguished panel of women ABI Presidents, including ABI's incoming President, about their experiences in the bankruptcy business. Join Deborah Williamson of Dykema Gossett PLLC (San Antonio), ABI President from 1998-99, Melissa S. Kibler of Mackinac Partners LLC (Chicago), ABI President from 2010-11, Patricia A. Redmond of Stearns, Weaver, Miller, Weissler, Alhadeff & Sitterson, PA (Miami), ABI President from 2013-14, and incoming ABI President Alane A. Becket of Becket & Lee LLP (Malvern, Pa.) as they talk about the challenges they overcame in their practices and provide advice for young professionals considering a career in the bankruptcy field. Click here to listen. A new ruling in the Southern District of Florida has set a precedent for the legal classification of monetary awards in the National Football League’s concussion litigation settlement, the Daily Business Review reported. U.S. District Judge Kathleen Williams on Tuesday issued an order affirming a bankruptcy court’s finding that funds from the NFL’s settlement with players who sustained chronic traumatic encephalopathy injuries qualify as disability benefits. The case, Salkin v. Williams, reached the federal court following an appeal from attorney Mark Bonacquisti, who represented the trustee looking to seize settlement money from former NFL player Darryl Williams. Miami-born Williams had played for the Cincinnati Bengals as well as the Seattle Seahawks before retiring in 2001 after 10 seasons. When he filed for chapter 7 bankruptcy in May 2016, he sought to keep his CTE-related funds exempt from seizure. “The crux of appellant’s argument on appeal is that the failure of the NFL settlement to include the magic phrase ‘disability policy’ renders [U.S. Bankruptcy Court] Judge Olson’s reasoned decision overruling the trustee’s objection ‘extreme,’ ‘remarkable’ and clearly erroneous,” the judge wrote in her summary. But in the issue of first impression, the judge found that the settlement is designed to provide financial relief to NFL players suffering from “qualified neuro-cognitive disabilities.” Because recipients of the settlement “must qualify and submit to authorized medical testing from authorized providers,” and any monetary award is subject to the severity of a player’s condition, she concluded that “the settlement only functions as a disability policy.” Lawyer Chad Van Horn, who represented Williams, said that the crux of their argument was that money from the concussion settlement was no different from other disability claims, meaning it’d be exempt property under Florida bankruptcy law. Commentary: Can Detroit's Turnaround Go Beyond Downtown? Since Detroit entered into the nation’s largest municipal bankruptcy back in 2013, the city has been heralded as an unexpected comeback story, attracting billions of dollars worth of investment. But nearly all of that money and development has been concentrated in and around downtown. That’s left residents who occupy more than 100 square miles in the rest of the city wondering when it will be their turn for a comeback, according to a Governing Magazine commentary. Mayor Mike Duggan (D) says that day is near. Last year, he pledged to spend $130 million over the next five years on parks, streetscapes and development in 60 different neighborhoods. He got a big boost in December, when seven companies pledged $5 million each to the city’s strategic neighborhood fund. “We’re starting to see development through the corridor of all these different areas,” Duggan said. The city’s neighborhoods can use a lot of help, according to the commentary. Detroit’s median income remains half that of Michigan as a whole. More than a third of the city’s residents — and more than half of its children — live in poverty. It’s been estimated that Detroit is pocked by 30,000 abandoned homes and as many as 90,000 vacant lots, according to the commentary. U.S. consumer prices rose 0.2 percent in February, pushed up slightly by higher gasoline and housing costs even as the prices for autos and clothing slumped, the Associated Press reported. The Labor Department said this week that the consumer price index rose a modest 1.5 percent last month from a year ago. Inflation has been muted despite the solid job market, causing average hourly earnings — after being adjusted for consumer prices — to climb 1.9 percent in the past year. This marks the strongest inflation-adjusted wage growth since November 2015, an increase that would likely help consumer spending and economic growth. The low level of inflation also gives the Federal Reserve more flexibility in holding off on further increases to a key short-term interest rate, enabling the U.S. central bank to provide support for economic growth. Some economists expect inflation to pick up as the benefits of higher wages flow through the economy. Ian Shepherdson, chief economist at Pantheon Macroeconomics, said the consumer price index could breach 2.5 percent by the end of the year, which could create a problem for the Fed if it holds rates at their current level for 2019. ABI's ASM this April features 30 sessions with expert speakers analyzing important bankruptcy cases and issues. A special “Eye on Bankruptcy” episode will feature a national security expert will discuss the growing — and alarming — phenomenon of countries with adverse interests to the U.S. using U.S. bankruptcy courts and investment in venture capital firms to secure access to sensitive American technology. In addition, legendary journalist and author Bob Woodward will provide the keynote. These are just some of the many reasons to join the more than 700 already registered for ASM. Register here. Register here. Sign up Today to Receive Rochelle’s Daily Wire by E-mail! Have you signed up for Rochelle’s Daily Wire in the ABI Newsroom? Receive Bill Rochelle’s exclusive perspectives and analyses of important case decisions via e-mail! Tap into Rochelle’s Daily Wire via the ABI Newsroom and Twitter!